Do you suffer from poor circulation? Are your legs slowing you down? Now you can enjoy fast acting relief from aches, pains & swelling. 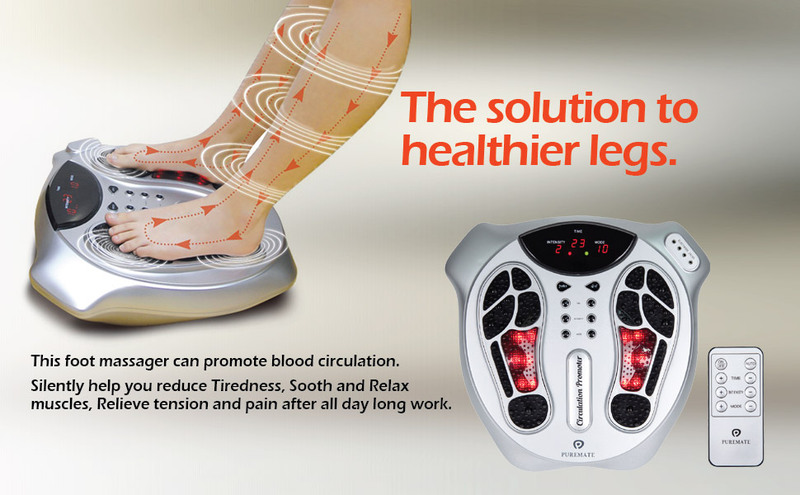 The PureMate Foot Circulation Massager is the only device of its kind proven May help to improve circulation, reduce swelling, alleviate aches and pains, warm the feet, and increase oxygenated blood in the lower legs. Using the PureMate Foot Circulation Booster for just 30 minutes per day may help maintain healthy leg circulation, provide fast acting relief from swollen legs and feet and alleviate tired, aching legs. It is mains operated and comes with a remote control making it so easy to use. The 30 minute auto programme allows you to sit back, relax and let the PureMate Foot Circulation Massager go to work while you are reading, watching the TV or simply enjoying a cup of tea. Each session on your TENS machine lasts 30 minutes and can be carried out from the comfort at your home. The feeling is incredibly relaxing. There are 15 different treatment programs, each one offering a slightly different treatment pattern and intensity levels ranging from 0 to 99. Once you have selected your treatment program, the intensity level can be set at a comfortable level for your feet. You will feel a tingling sensation in your toes and feet. Caution: To be used Barefoot without any socks and only operates when both feet are placed on it. 3. Relax, allowing the machine to get to work. If you have a pacemaker fitted or a cardiac condition. If you have sensory nerve damage. If you suffer with extreme varicose veins. Couldn't be happier with this product. I suffer with Restless Leg Syndrome. For people who know what RLS is will be pleased to know this product does actually help relieve the symptoms. It works for me but please remember everyone reacts to treatment differently. Before I use to have to walk around to relieve the ache in my legs. Now....30 to 60 minutes using the Puremate Foot Circulation Machine while relaxing watching TV does me fine and I am sleeping better too. 10 out of 10 for this very helpful device.